While gnocchi is more of a comfort food (read: heavy, better suited to winter months), it is a great vehicle for the bounty of summer farmer’s markets. This ricotta version is insanely easy, very light, and perfect to toss with a mix of fresh summer veggies. 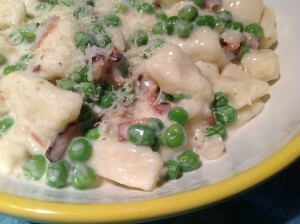 Use the ricotta gnocchi recipe below to toss with your favorite sauce, or try the pea and bacon cream sauce. In a large bowl, stir together ricotta, eggs, cheese, and salt and pepper to taste. Add the flour and stir to form a soft, wet dough. On a well floured surface and with floured hands, take a portion of the dough and roll it into 1-inch thick ropes. Cut crosswise into 1-inch pieces with a lightly floured knife. Cook gnocchi in 2 batches in pot of boiling salted water, adding a few at a time to pot and stirring occasionally, until cooked through (cut one in half to check), 3 to 4 minutes per batch. Lift out with a slotted spoon and drain in colander. Once drained, add to your favorite sauce – such as a classic tomato sauce, pesto, veggies sauteed in olive oil, or the pea and bacon cream sauce pictured here. If you’re going to be ready to eat when you’re done making the dough, put a large pot of water on to boil before you start rolling gnocchi so it’s ready when you are. If you’d like to make these in advance, make the dough and chill it until you’re ready. Then you can put the water on to boil and roll the gnocchi. In a saute pan, cook the bacon until the fat is rendered out; remove the bacon with a slotted spoon to drain. Discard most of the fat, saving approximately 2 teaspoons. Add the onions and saute until translucent, then add the peas and cream, and bring to a simmer. Season the sauce with salt and pepper to taste. Toss the sauce with the gnocchi, cooked bacon, and parmesan cheese. Eat and be happy.